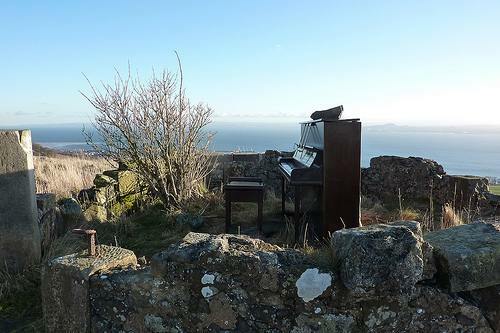 After her bedroom—and then later, the house—had vanished, all that was left on the island was her piano, on a cliff overlooking the shining sea. Muriel couldn’t quite remember when her neighbors, and every one of the solid bricks laid angle by angle to construct their houses and the town, had disappeared. The edges of her memory were filmy as her dressing gown, a lacy, thin cotton thing. The only familiar thing left from her house. Besides the piano, which was somehow still in tune despite being outside in the elements, exposed to the sting of salt air. She couldn’t remember when everything and everyone she knew had vanished, leaving her alone with only the sharp, jagged cliffs, the bright breaks of the waves, and an upright Steinway that never needed to be tuned. But the chill of her piano’s ivory keys. That, she remembered. Allie Marini Batts is an MFA candidate at Antioch University of Los Angeles, meaning she can explain deconstructionism, but cannot perform simple math. Her work has been nominated for Best of the Net and the Pushcart Prize. She contributes to the publication of AULA’s Lunch Ticket literary magazine, Spry Literary Journal, The Weekenders Magazine, Mojave River Review, and The Bookshelf Bombshells. She is the author of the poetry chapbooks, You Might Curse Before You Bless (ELJ Publications, 2013), Unmade & Other Poems (Beautysleep Press, 2013), and This Is How We End (forthcoming, Bitterzoet, 2014).